Quality, flexibility and style! 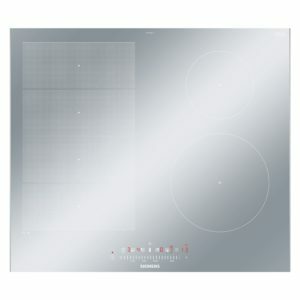 That's what you'll find here in this superb induction hob from Siemens. Featuring four cooking zones, two of which can be combined into one large flexinduction zone, this hob makes cooking, boiling and frying with different sized pans so easy. This model also features easy to use touch controls and a boost setting for each zone. Finished in silver glass with stainless steel side trims and a bevelled front the EX679FEC1E creates a stylish streamlined look and is easy to keep clean.